Keeping the right number of products in stock can be a challenge – between new orders coming in, returned products being restocked, and other inventory fluctuations, a purchase order created just a few hours ago might already be outdated by the time it’s sent to the vendor. And if your business management solution requires you to manually create POs, or if it generates new POs every time there’s a change without considering existing ones, you could end up with a handful of inaccurate or overlapping purchase orders for a single product in the same day. Wouldn’t it be great if your ERP software could track changes in inventory and automatically generate or adjust pending POs in real time? Our smart reorder management features ensure your purchase orders are always up to date. This saves you time and minimizes the potential for errors that comes with manual data entry. To learn how aACE streamlines this essential process, let’s take a look at our fictional company, aACME Education Solutions, handling inventory reorder management in their day-to-day operations. 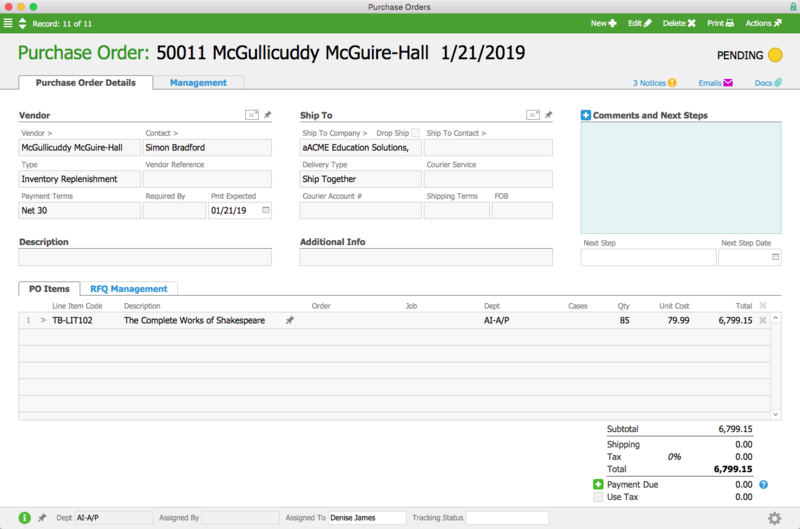 As we saw in the backorder management workflow, aACME’s textbooks have a replenishment balance of 50 and a target balance of 125. This means that when a textbook’s inventory dips below 50, aACE automatically generates a purchase order to bring the available inventory back up to 125.
aACME salesperson Jamie Gianelli receives an order for 25 English textbooks from the Brightside Charter School. aACME currently has 60 textbooks in stock, so when Jamie processes the order, a PO is automatically generated for 90 textbooks. It’s kept in Pending status until the A/P department is ready to open it and send it to the vendor. Over in the warehouse, a shipment comes in from the Full STEAM Academy Charter School. They accidentally ordered too many English textbooks, so they’re returning five. 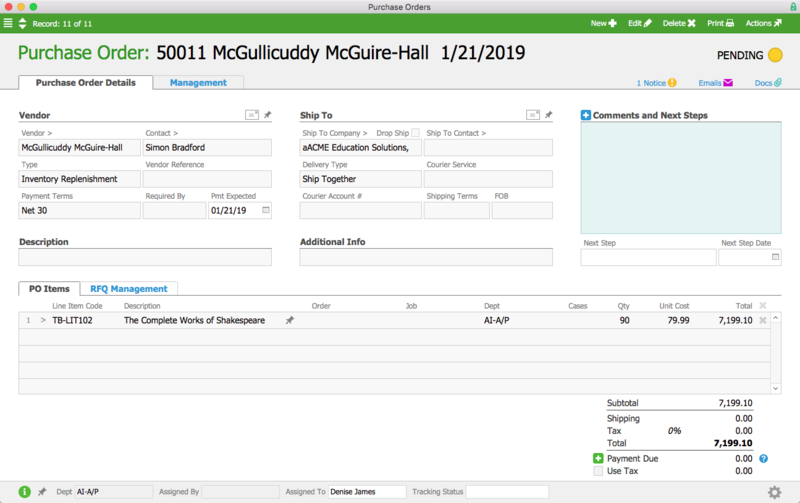 When Drew Sanderson processes the incoming shipment and returns the textbooks to aACME’s inventory, aACE automatically removes five textbooks from the pending purchase order. Back in the Sales department, Mara Harvey receives an order for 30 textbooks from the Shea Township School District. Because the textbook PO from the last order hasn’t yet been sent to the vendor, aACE simply updates that record, adding the 30 additional textbooks to the existing purchase order instead of generating a new one. At the end of the day, Denise James in the Accounts Payable department is ready to send the PO off to the vendor. She knows aACE has been adjusting the PO in real time based on current demand, so Denise feels confident that she’s ordering the perfect number of textbooks. She can review recent updates to the PO by checking the log. When the shipment arrives from the vendor a few days later, there are enough textbooks to bring the available inventory back to 125.
aACE makes inventory reorder management easy and accurate, saving you time and money by eliminating the need to manually enter and sort through POs. And because aACE leaves the PO in pending status until it’s approved, you’ll never have to worry about sinking money into products you don’t need. Our smart automation and real-time updates give you the peace of mind that comes from knowing you’ll always have the right products on hand. 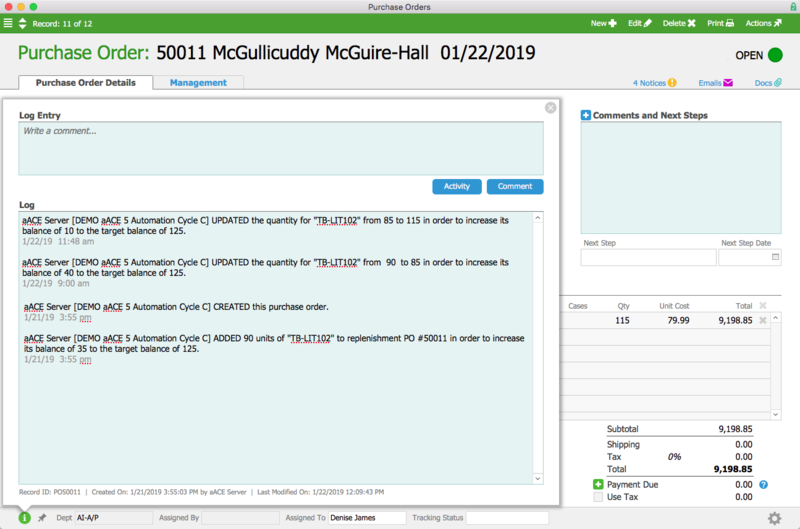 See more of aACE’s reorder management in action by reading our feature highlight on backorder management. And to learn more about what aACE can do for your business, check out our customer success stories today.